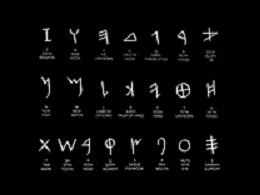 Phoenician Alphabet - The alphabet is the greatest contribution of the Phoenicians to civilization. It was a radical shift away from pictographic writing in that the symbols no longer represented entire words, but were broken down into consonants. This allowed a symbol, or letter, to simply represent a sound, not an object. It was more advanced than hieroglyphics and Cuneiform in that, letters were assigned a phonetic value (sound) which could be grouped together in different combinations to form words. The earliest alphabetic writing dates back to the beginning of the second millennium. The Phoenician alphabet is called an abjad, meaning it had no vowels. Vowel sounds were spoken automatically without having letters assigned to them. They were eventually added by succeeding civilizations which adopted the Phoenician alphabet and adapted it to their own language. The alphabet eventually became the basis for virtually all writing in the Western world. Incidentally, the word "phonetic" is derived from the word for the civilization that gave us this invention.